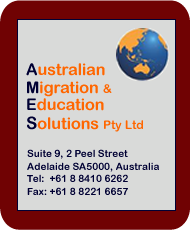 The onshore Skilled Graduate visa (Subclass 485) is a TEMPORARY visa for international students in Australia who are unable to meet the requirements for a Permanent or Provisional (Temporary) Skilled Visa. The Subclass 485 visa enables former international students to complete a post-graduate professional year, gain skilled work experience or improve their English. have a score of at least IELTS 6 in all components. If you are an international student who held a Subclass 572, 573 or 574 visa on 8 February 2010, you can apply for a Subclass 485 visa before 1 January 2013, if your nominated occupation is listed either on the current SOL or on the previous oneRight-click to download the previous Skilled Occupations List (which was replaced on 1 July 2010 by the current one)..
for which all study undertaken was in English. As a Skilled Graduate visa holder you can lodge an application for a PERMANENT Skilled Visa at any time during the 18 months of your visa, but you will need to be able to meet the requirements for lodging a valid application. The visas you can apply for are the Skilled Independent Visa (subclass 885), the Skilled Sponsored Visa (subclass 886) and the Skilled Regional Sponsored Visa (subclass 487), as well as any of the Employer Sponsored Visas. The Employer Sponsored visas are not points-tested. The Employer Sponsored visas have their own sets of requirements.